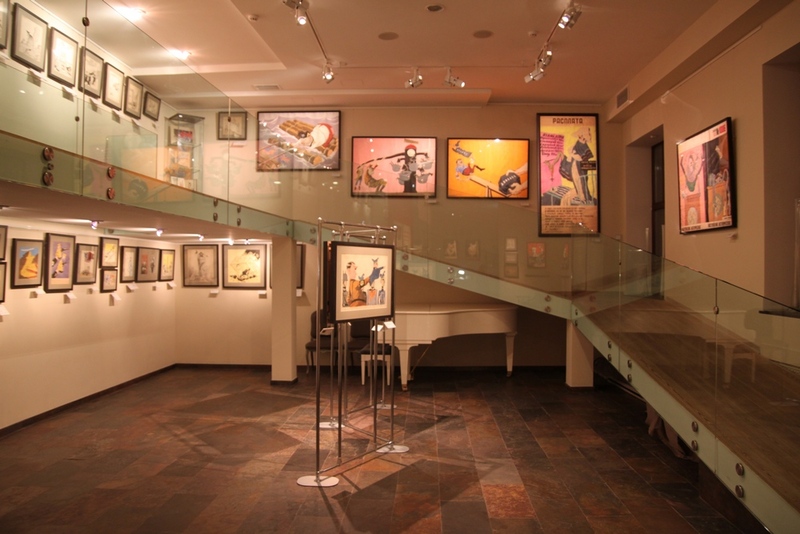 Mamontov`s gallery presents a unique collection of satirical works made by outstanding Soviet graphics and artists of the 20th century – masters of political satire known under the pseudonym «Kukriniksy». These works were brought from Mamontov`s collection, which is one of the largest private collections of Kukriniksy`s works. About 100 authentic drawings and posters are exhibited there. Among them are some of the most striking works of the wartime artists: original posters «Windows TASS», caricatures, designs, sketches made during the Nuremberg trials, and pictorial etudes. Many of the works do not appear in editions dedicated to Kukriniksy and are published exclusively in the catalogues of Mamontov`s gallery. The legendary pseudonym ‘Kukriniksy’ united three artists – Michael Vasilyevich Kupriyanov (1903-1991), Porphiriy Nikitich Krilov (1902-1990) and Nikolay Aleksandrovich Sokolov (1903-2000). Their creative group was founded in 1924, during their education in VKHUTEMAS . They worked together for more than 60 years and were never separated. The name Kukriniksy became not only the pseudonym of the group, but also the symbol of a caustic political caricature, which brought a worldwide popularity to the three artists. Michael Vasilyevich Kupriyanov (1903-1991), Porphiriy Nikitich Krilov (1902-1990) and Nikolay Aleksandrovich Sokolov (1903-2000). They began to draw anti-fascist caricatures in the 1930s. 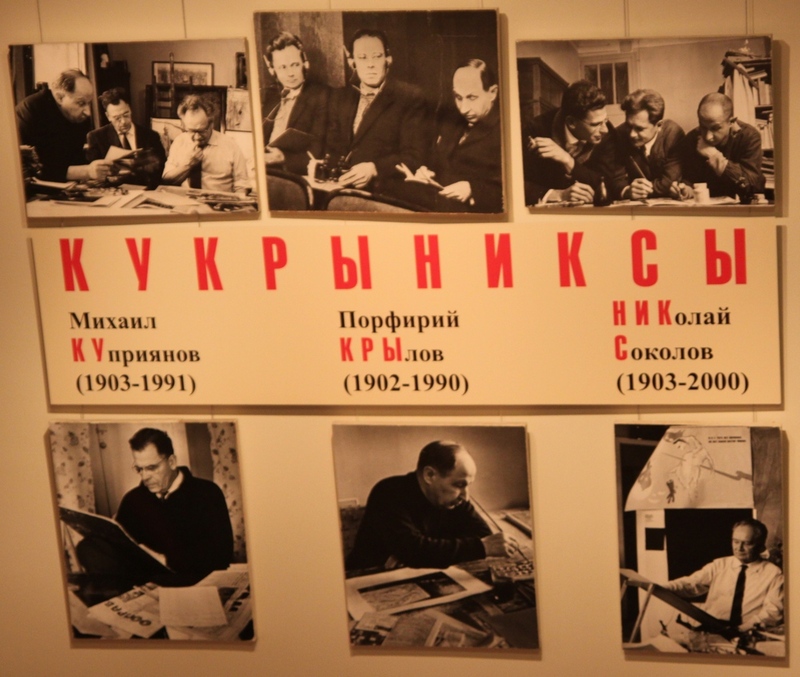 However, it was only during the war that the artists grew into a true artistic maturity, and now played one of the central roles in the art of the Great Patriotic War. Caricatures and posters made by Kukriniksy were sold by the millions. They were very well-known in the Soviet Union and even abroad. 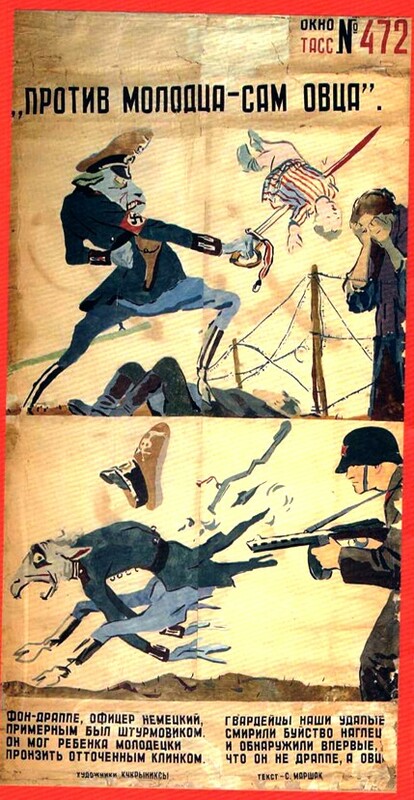 By the evening of June 22nd 1941, Kukriniksy had made a draft of the poster «Smash and Destroy the enemy», on June 24th the poster appeared all over the streets of Moscow and other cities. They worked hard every day for 5 years of the war. They made caricatures for the next edition of the newspaper «Truth» or «The Crocodile» magazine. 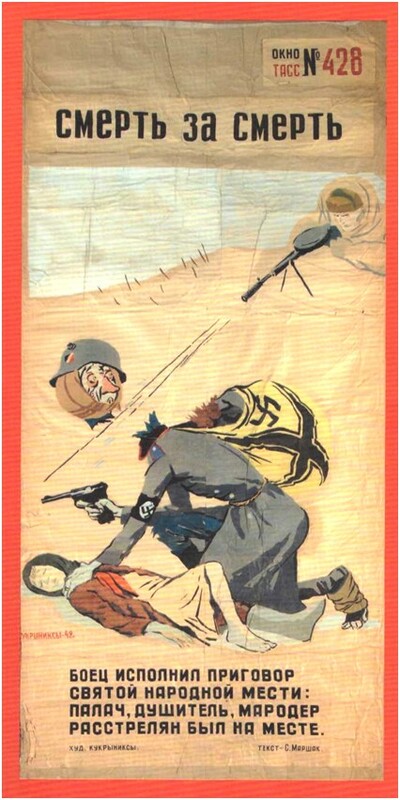 They made leaflets for German soldiers (serving them as a pass to yield themselves prisoners). They made packaging designs for food concentrates. They also drew posters for Windows TASS. Everyday new posters appeared in the streets. Full of bitter, heavy sarcasm and bold humor, they carried confidence in the victory over evil through the horrors of war. Exhausted by pain, misery and fear, people always looked forward to them with hope. The artists worked with amazing dedication. Of course, not all the posters became a masterpiece, but there were no phrases like «we had no time to do it» or «we failed to do it». It was a time of war. During the air raids, they would put on gas masks and walk down to the yard to keep watch or they climbed on the roof to stew «lighters» — and then they went back to their work, as if they were fighting hand to hand with the enemy. The famous Windows TASS is a unique event in poster and satirical art. Various artists created posters, but Kukriniksy`s impact was especially significant. The originals of the Windows TASS take an important place in the collection of Kukriniksy`s works in Mamontov`s gallery. Some are enormous works, glued together from several thick sheets, they were defiantly bright and colorful. 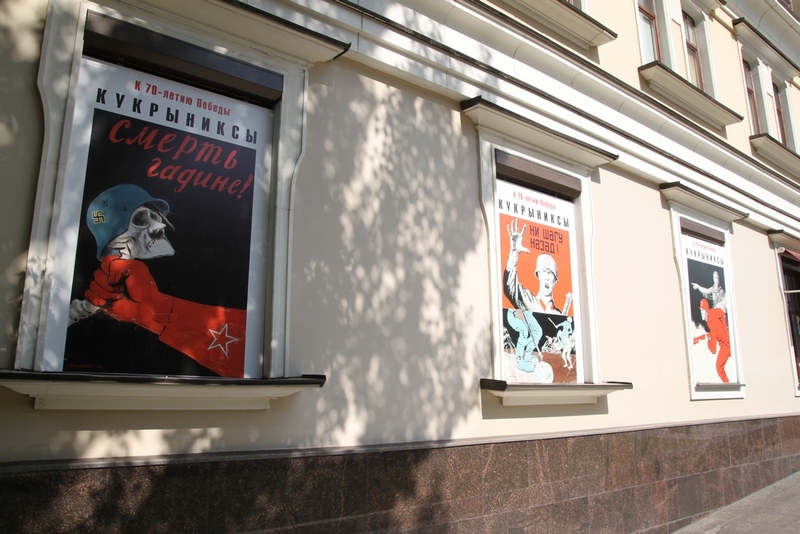 But now, already yellowed and time-worn, Kukriniksy`s satirical posters for the Windows TASS can be regarded as the avangard of the soviet war-time art. In the early times, during the époque of brave experiments, Kukriniksy worked with Mayakovsky, Meyerhold, and Eisenstein. Kukrinksy paid attention mostly to the decorative side of the picture, striving to make it bright and conspicuous. Created by the image of «the Windows of growth» hanging in the streets, Windows TASS was fighting against fascism as with madness, accusing it of inhumanity. The artists themselves regarded their work as opposition. Filled with publicistic pathos, Kukriniksy`s art opposed the barbarity and cruelty of fascism. «The art of unmasking metaphor» — that is how the famous Russian critic Aleksander Kamensky called Kukrinksy`s caricatures. It might seem that the ridiculous and despised enemy is no longer frightening. However, satirical visions of the enemy, created by the artists, evoked not laughter, but anger, disgust and hatred. Kukriniksy`s Placate satire is not funny and surely not innocuous, but rough and forthright, angry and acrimonious. It`s emotional characteristics are sincerity and passion. Their artistic talent possessed a virtuous mastery and plastic expressivity. It`s historical value is priceless. Many poets wrote texts for the Windows TASS. Picture and word were combined no matter which was created first. Thus, the placate on which a fascist looking like a gorilla is holding a machine gun and stepping on the corpses of women and children was created less than twenty-four hours after the verse «Kill him!» by Simonov had been published. But most parts of Kukriniksy`s caricatures and placates were created in co-authorship with Samuel Marshak. On one of the first days of the war, Marshak addressed Kukriniksy with the proposal to bring together verse and image. « And the next day we were sitting at an opened table not yet the two of us, but the four – N. Sokolov remembers – long sheets of paper, jars with gouache, ink, brushes, photographs with Hitler, Goebbels, Goering. Everyone was working and worrying: he – about the picture, we — about the verse». The results of this co-authorship are presented in Mamontov`s collection: originals of placates «Against the good guy – you`re a sheep!», «Death for death», «Fascist empire is trembling» , the sketch of the placate «Parasite on parasite», caricatures «Romelevsky`s march», «Mineral waters», «The restless dead», illustrations to the collections of war poems «The lesson of history», «Black and white», «Kaput!» and others. Kukriniksy`s creations belong to the classical traditions of satiric graphics based on the devices of visual characteristics, assimilations and metaphors. Many of these works were directed as a tragicomedy with scenes of cruelty and gore. The image of an enemy was developed in connection with the changing events of the war, yet it is always cruel, ridiculous and silly. At the beginning of the war – a fierce conqueror. As war events unfold – a pathetic loser. At every war the image of an enemy – a marionette appears («Gustav and Ustav», «Puppet-show», «Circus»). Blaming and cursing fascism Kukriniksy go into extremes. Usually they would use a well-known device depicting the enemy in the form of an animal, thus, marking the brutality of fascism («Kill him!», «Doigralsya»); they would visualize proverbs and catchphrases («Молодецсредиовец, противмолодца — самовца»); invent words-images ( for instance, «krysling» — a being with the body of a rat and the head of a human), use the devices of «lubok» combing the picture with the text. The language of their caricature was precise and simple. There were not many details, but each was very expressive and, remarkably, unlike the image – the detail could be amusing («Bobbles» and others). Kukriniksy`s wit was inexhaustible. Their imagination and inventiveness were unbelievable. Their power lay in cohesion. One person could not have withstood such creative and emotional tension. As correspondents of the newspaper «Truth» Kukriniksy «reached Berlin» with their etudes, paints, albums and pencils (on May 21st 1945 the artists were sent to Berlin to collect the material about the signing of the act of the unconditional surrender of Germany), they attended the Nuremberg Trials. Mamontov`s collection contains the famous pictures made by Kukriniksy in the courtroom, including caricatures of Hess and other participants of the trials whose faces for the long years of war the artists were studying by photographs and newsreels. And again they had to work operatively. Pictures were immediately sent by plane to the editor. The main objects of the caricatures were, Hitler, Herring, Goebbels, and Goering. They were familiar with Kukriniksy`s paintings so well that they even included them in the list of those who would potentially be publicly executed if the Germans ever conquered Moscow. At the Nuremberg Trials, they had to face each other. It was a war of nerves…At the sight of the artists, armed with binoculars and pencils, the criminals hid their faces. From their travel to Berlin Kukriniksy, each individually, they brought many lyrical picturesque etudes – the images of the city turned into ruins. (N.Sokolov. «Berlin. Wilhelm Castle», «Berlin. The monument of Wilhelm I», «Berlin. Aleksanderplatz». 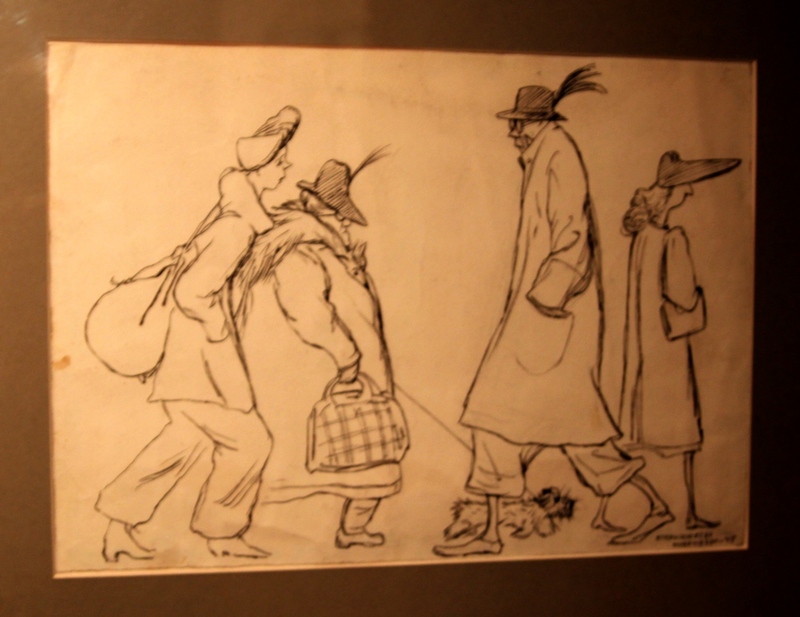 During their free time in Berlin and Nuremberg, Kukriniksy made many naturalistic sketches of peaceful life in the city and hurrying pictures made in haste (N.Sokolov «In Nuremberg Streets, December 1945), «The citizens of Nuremberg», «In Berlin streets»). «Basically women, children, the old. Most of them carrying bundles, suitcases, almost everyone had a backpack… mothers with children and their possessions. Fashionable ladies would occur from time to time, the elderly hurrying to a funeral» (from Kukriniksy`s memories). As it`s usually the thing with Kukriniksy, the paintings are remarkable for the sharpness and accuracy of their psychological and plastic characteristics. During the war, Kukriniksy fought with fascism working hard daily. His pain and anger resulted in a scathing, angry, ruthless satire. Drawings made in Germany were different. The citizens of Nuremberg, 1945. Not an embittered enemy, but a changed people who have overcome the horror of war and have now return to civilian life. And these peaceful sketches, no worse than the placates, indicate that the war is an unjustified evil which must be struggled with. There is no better reward or consolation than peace. «Many hitlerites, trying to escape responsibility for their crimes, declare themselves dead, change surnames and go to Spain and other «neutral countries» — from newspapers. (Lavrushinsky pereulok,11, building №1) in July 2015. VKHUTEMAS — Higher Art and Technical Studios. Was the Russian state art and technical school founded in 1920 in Moscow.